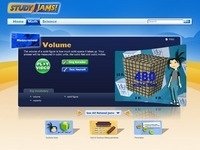 Study jams video and test about volume. From AAA Math... Scroll down to review how to figure out the volume for different types of figures. From Learn Zillion showing how to figure out the area of a rectangular prism or cube.